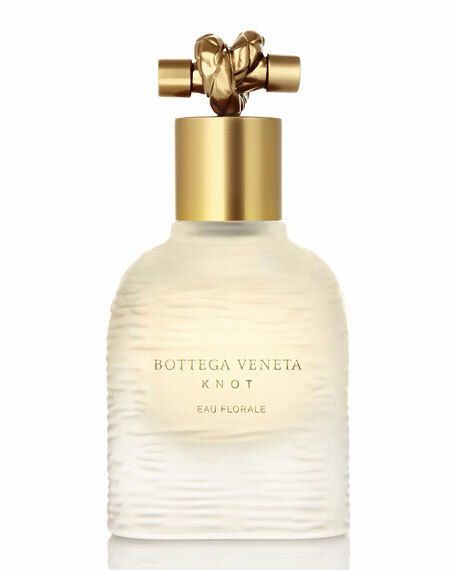 Bottega Veneta Bottega Veneta Knot Eau Florale, 2.5 oz. Knot Eau Florale is the continuation of the collaboration between Tomas Maier and master perfumer Daniela Andrier. A delicate floral expression of the Knot fragrance, it features amplified notes of Rose and Peony layered with the softness of musk. It was 1966 in Vicenza, Italy, when Vittorio and Laura Moltedo introduced Bottega Veneta with a collection of buttery soft leather handbags. The line's signature intrecciato weave set the bags apart and made them must-haves. Over the years, Bottega Veneta expanded its vision of extraordinary yet subtle luxury to include ready-to-wear, shoes, and more. Today, creative director Tomas Maier helms the label, continuing in the tradition of tasteful sophistication.